One of four “workhorse” accelerating rate calorimeters. These systems run continuously to keep up with customer needs. Lithium-ion battery technology offers great benefits in portable power, but an essential challenge is to ensure operational safety. Current lithium-ion technologies are prone to thermal runaway reactions. In order for electric vehicle (EV) and hybrid electric vehicle (HEV) technologies to succeed in the marketplace, they must be very safe and reliable. Therefore, either the consequences of a thermal runaway or the severity of a thermal runaway reaction must be minimized under both normal operations and abusive conditions. Also, EV and HEV performance and life-cycle cost are heavily influenced by battery pack performance—including the pack’s operating temperature profile. Uneven temperature distribution in a battery pack leads to unbalanced modules and reduced performance. Therefore, manufacturers seek to develop packs that manage their thermal profile so that modules operate within the desired range. Calorimetry, the science of measuring the heat of chemical reactions or physical changes, techniques are based on measuring heat that may be generated (exothermic process), consumed (endothermic process) or simply dissipated by a sample at controlled temperatures, providing accurate assessment of heat-evolution and potential thermal hazards from batteries of all sizes. At Sandia, we use a variety of calorimetry techniques to characterize energy storage systems. 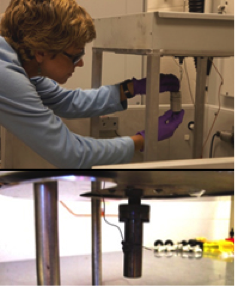 Accelerating rate calorimetry (ARC) is used to quantify calorific output and heating rates for runaway reactions in lithium-ion cells to evaluate materials and strategies to minimize the severity of these reactions. In addition, we can sample gas species evolved during these reactions to better understand the degradation products, mechanisms, and potential hazards associated with these products. 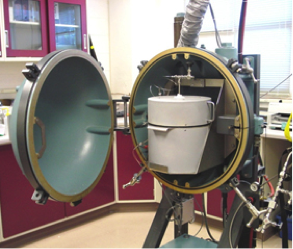 Another technique is isothermal calorimetry used to measure cell or battery heat capacity and heat generation during charge/discharge profiles. This information can be used to model, design, and test the performance of a battery’s thermal management system. Through calorimetry, it is possible to determine the temperature at which lithium-ion cells or their components exhibit a highly exothermic reaction during use or storage, the quantity of energy released during the reaction, the reaction speed and the pressure level reached due to the formed decomposition gas. A Sandia researcher prepares samples for accelerating rate calorimetry experiments.